A great addition to the RS Aero calendar joining a historic event – this was the 56th running of the Warming Pan – traditionally a season opener for Merlins, N12’s and the class list has evolved over the years. This year the significant fleets were the Merlins, Foxers and an RS Aero fleet. The first race started down river with the tide just starting to come in. The course a single lap beat/fetch out of the river passing the last East cardinal to starboard, running towards Southampton to a turning mark, beating back past the Hamble entrance running back to a mark near the cardinal then up the river past the club and beating back over the line. Not your usual many laps round the cans. 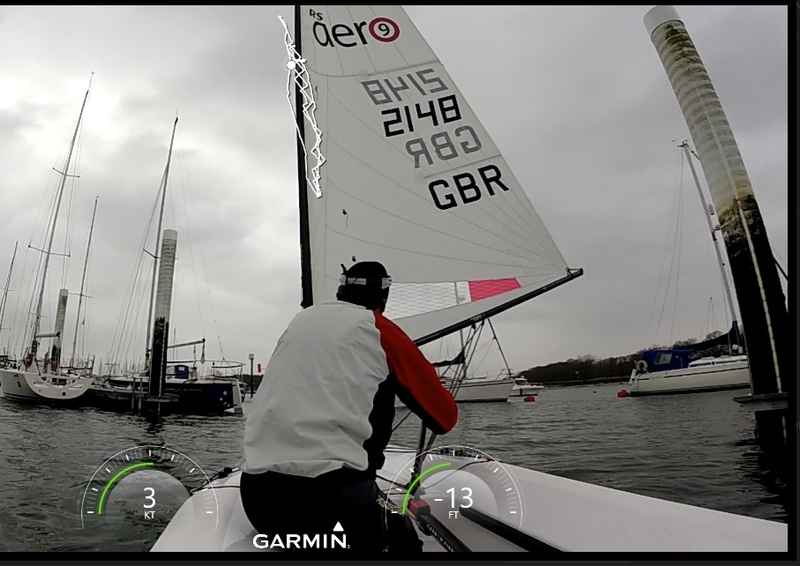 We had two RS Aero 9s, a handful of RS Aero 7’s and an RS Aero 5 with the forecast for light winds. Fortunately there was a shade more breeze than forecast especially further down river. Off the start Gareth Griffiths in the '9' powered away working the left shore pulling out a good lead on the fleet. Further back close racing in the '7’s saw Karen Main just pipping Toby Schofield. Race 2 added an extra beat-run in the Solent but this time although Gareth and Greg Bartlett (the other '9') led off the start, down the South shore the leading '7’s followed Andy Hill’s lead and dived into the moorings behind the pontoons and glided along the North shore out of the tide to lead the '9’s for the first half of the race. Although the '9’s got past, on PY it was a one way street with Toby winning from Andy, Karen and Tim Norris before the '9’s with Greg ahead of Gareth. By Sunday the wind had changed to the North blowing straight down the river. The race Officer saw this as an opportunity for pure river sailing with beats and runs among the moorings. For the morning we started down river – a running start – to a mark off the left or South shore, beat all the way back just past the club rinse and repeat run down river and beat back to the finish (same as start line). The run kept the fleet well bunched with the tail always blanketing the leaders but the two '9’s rounded just ahead of the entire '7' pack with Greg leading. Up the beat Greg maintained the lead pulling away slightly. Down the second run though Gareth took the hint from race 2 and slipped inside the pontoons – initially this looked a mistake as half way down the leg Greg seemed well clear and Toby looked to be alongside, but then the tide kicked in with the mark in the channel and the a strong flood tide on the left bank Greg and Toby almost stopped while Gareth found a back eddy in the shallows on the North shore to then come fast reaching across the river and take a handy lead. It wasn’t enough quite though with Toby taking another handicap win Gareth second, Karen third and Greg back in sixth. All to play for on the last race and this time the RO set the opposite course – beating a long way up river giving interesting choices of which channel to sail up – outside pontoons, up the gap between trots of pontoons or inshore. The wind up-river was significantly less and the width more constrained bringing roll tacking into play. Greg worked up the middle between pontoons, Gareth initially up the right bank (though he switched to left bank at the end) and I think Toby and Karen mostly up the middle. At the windward mark Greg had a handy lead over Gareth with Toby third starting a very long run against the flood tide all the way past the club. A very long run indeed and Gareth slowly closed on Greg finally getting a leeward overlap as they both hugged the right (North) shore sailing by the lee on Starboard before gybing and broad reaching across the current to the leeward mark. Up the last beat Gareth pulled away from Greg but again the '7’s were too close with Toby taking the handicap win from Karen, Gareth third followed by Tim, Andy and Greg. Final results saw Toby take the overall win in his RS Aero 7, from Gareth and then Karen. 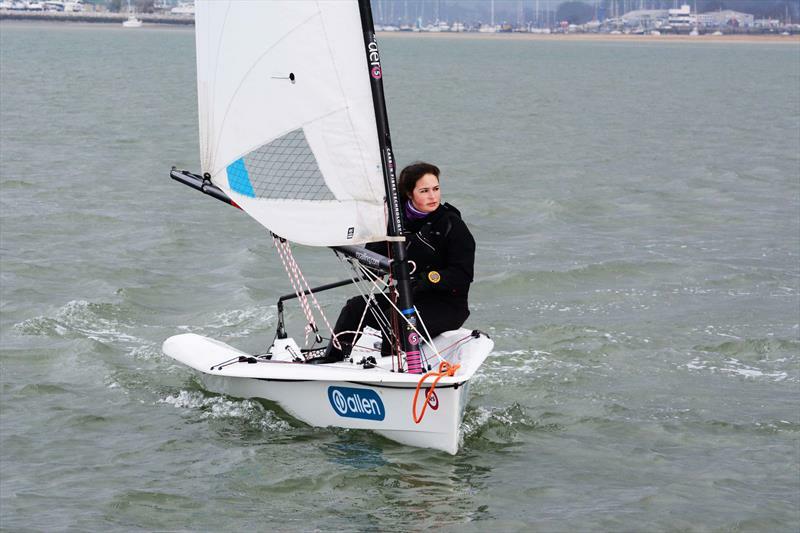 Congratulations also go to Natasha Sion, persevering to finish 3 races in the lightish winds and strong currents in her RS Aero 5. 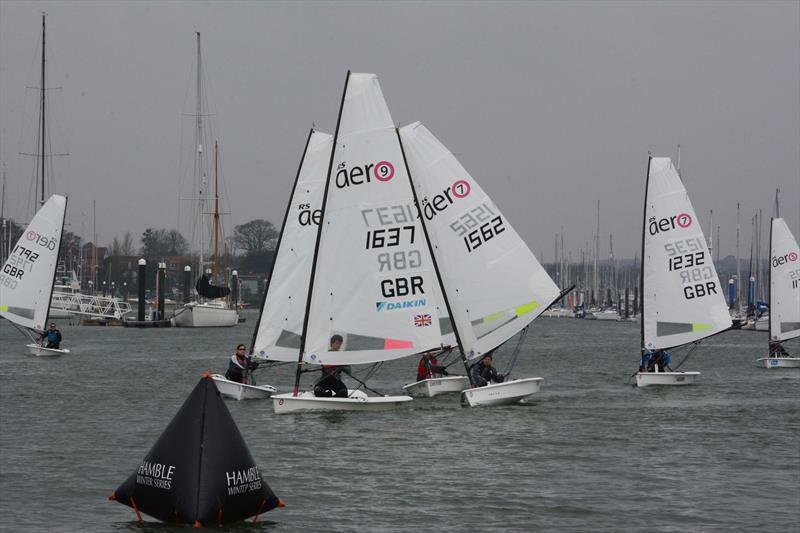 Thanks to Hamble River SC for hosting a great weekend and the Class' invite. 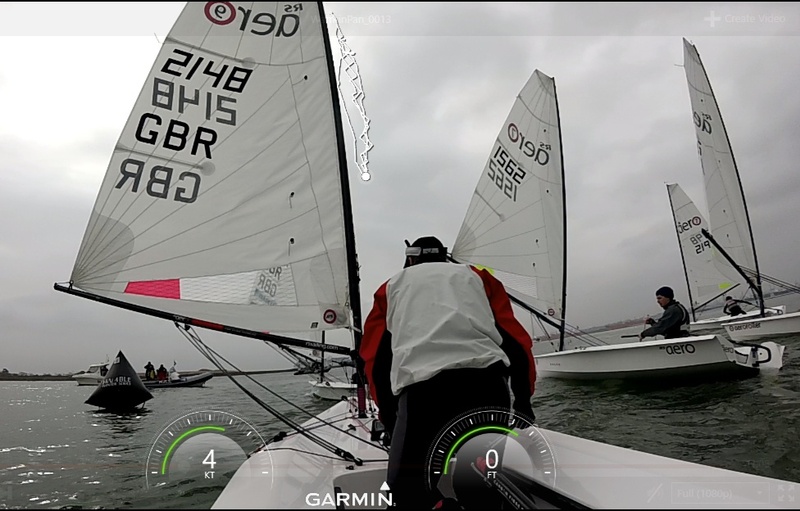 Great fun, friendly club, good food but a whole different type of sailing where you had to keep your eyes open for 50 foot cruisers barrelling through the fleet and time your tacks to make gaps between moored boats and see who’s nerve goes first close tacking or gybing up the shallows!